In Oslo last week, President Barack Obama ironically used his acceptance speech for the Nobel Peace Prize to deliver a lengthy defense of the “just war” theory and dismiss the idea that nonviolence is capable of addressing the world’s most pressing problems. After quoting Martin Luther King Jr. and giving his respects to Gandhi — two figures that Obama has repeatedly called personal heroes — the new peace laureate argued that he “cannot be guided by their examples alone” in his role as a head of state. Almost immediately after acknowledging that there is “nothing weak — nothing passive — nothing naïve — in the creed and lives of Gandhi and King,” Obama equated nonviolence with doing nothing. To live and act nonviolently, however, never involves standing “idle in the face of threats.” Dorothy Day, Cesar Chavez, Dave Dellinger, Daniel and Philip Berrigan, and countless other genuine peacemakers have put their lives on the line in the struggle for a more just world. Advocates of nonviolence, like Gandhi, simply believe that means and ends are inseparable – that responding in kind to an aggressor will only continue the cycle of violence. In 1943, for instance, when the order finally came to round up the nearly 8,000 Jews in Denmark, Danes spontaneously hid them in their homes, hospitals, and other public institutions over the span of one night. Then, at great personal risk to those involved, a secret network of fishing vessels successfully ferried almost their entire Jewish population to neutral Sweden. The Nazis captures only 481 Jews, and thanks to continued Danish pressure, nearly 90% of those deported to the Theresienstadt concentration camp survived the war. Obama’s rejection of negotiations as a possible solution to terrorism also doesn’t square with the evidence. After analyzing hundreds of terrorist groups that have operated over the last 40 years, a RAND corporation study published last year concluded that military force is almost never successful at stopping terrorism. The vast majority of terrorist groups that ended during that period “were penetrated and eliminated by local police and intelligence agencies (40%), or they reached a peaceful political accommodation with their government (43%).” In other words, negotiation is clearly possible. 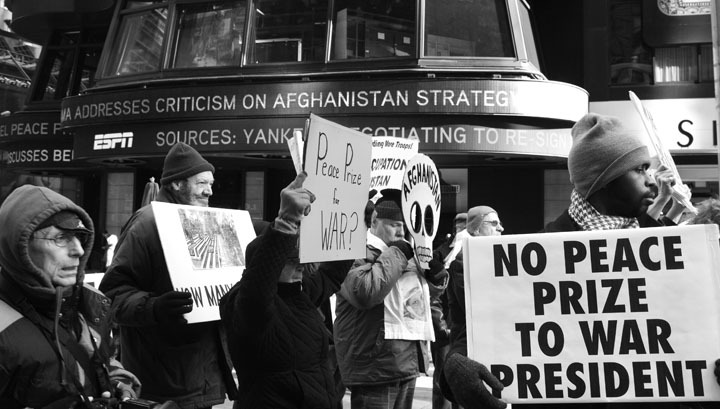 As I silently carried a cardboard coffin from the UN headquarters in New York to the military recruiting center in Times Square during a protest on the day of Obama’s speech, I couldn’t help but cringe to think of the president justifying the deployment of 30,000 more troops to the “graveyard of empires.” Every nonviolent alternative has not been exhausted. In reality, they have yet to be tried. President Obama is a tool and I don’t mean that in a derogatory sense. He is a puppet of the global elite, banksters and leaders of the military/industrial complex. You will NEVER find a President that will be 100% willing to withdraw troops from the Middle East as there is too much at stake there for the people that are pulling at the strings of the Commanders in Chief. Sadly, Mr. Stoner, the people are doomed as we are not in control. Stalin once said that it never mattered who the people voted for because they “always ended up voting for us”. A most troubling, yet poignant phrase. Until the people of the US shed themselves of the false left/right paradigm nothing will change. Ever. I was a bit astonished that John Woo’s op-ed “Platitudes won’t guarantee world peace” from the Phila. Inquirer was published in the Plain Dealer last Monday. Here is a guy that should be doing hard time in a federal prison. Be that as it may, would you please consider publishing a response to Mr. Yoo’s opinion – may I direct your attention to Eric Stoner’s recent piece – A Lesson on Nonviolence for the President.